Valentine's Day is around the corner (well...at our doorstep) so it's only right I share this one. 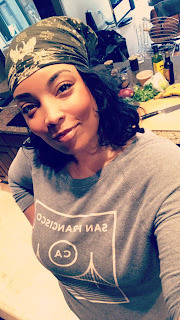 I purposefully shoved all of my blog/business/random life updates into my last post so that this one could be just a good, down and dirty recipe. A perfectly cooked piece of quality steak is prime date night food. Add truffle butter to that and you've got yourself a mouthwatering dish that is more than worthy of impressing the object of your heart's desire. I promise you that nailing this technique requires little more than a bit of your time and a few extra bucks at the grocery store. 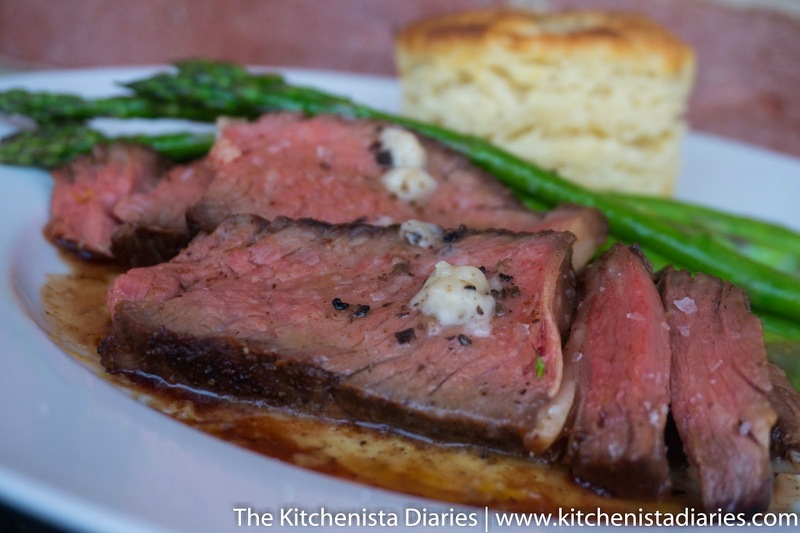 Take three minutes to watch the video clip below, and then I'll show you how I applied the "reverse sear" method to my own recipe which added a homemade steak rub and a final basting in truffle butter. First things first. It's super important that you buy the best steak you can afford here. This likely means a trip to a reputable grocer's specialty meat counter or your local butcher. You need a thick piece of boneless rib eye, at least 2". Anything smaller is better suited for the traditional pan-seared method. I had the butcher cut my steak 2" thick and it weighed in at 2.5 pounds. At $10.80/pound this wasn't a bad deal at all, considering it served 4 of us with leftovers for me the next day. 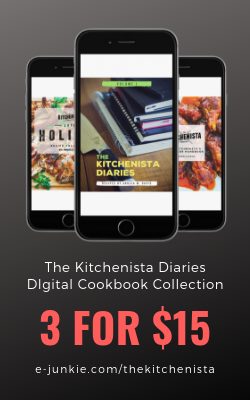 So even if your plan is to cook steak for two, you'll still want to plan on buying a piece about that size. Rib eye is so well marbled that as long as you cook it to medium rare or medium, leftovers will reheat beautifully without worry about overcooking. Considering the cost of steak for even one person at a decent restaurant, that is substantial savings. 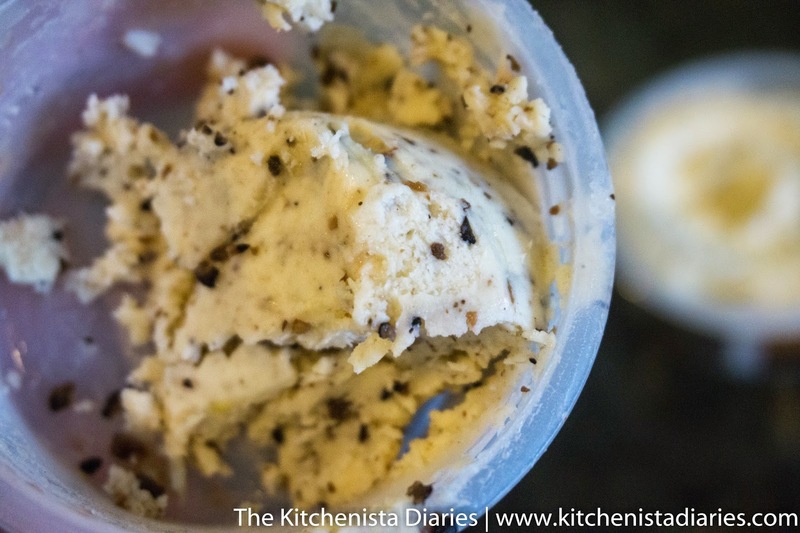 I first introduced truffle butter here at The Kitchenista Diaries in my Roasted Mushroom Mac & Cheese. Since then, I've found tons of uses for it and I've become downright addicted. It is the most luxurious burst of "umami" you could imagine. I just love the stuff. By the way, I recently tried a slightly less expensive version labeled as a truffle finishing butter. The taste was a bit off for me and not nearly as rich, so I recommend sticking to the good stuff. Look for truffle butter in your gourmet meat or dairy section. It should have real flakes of black truffles in it, and not just truffle oil or artificial flavors. 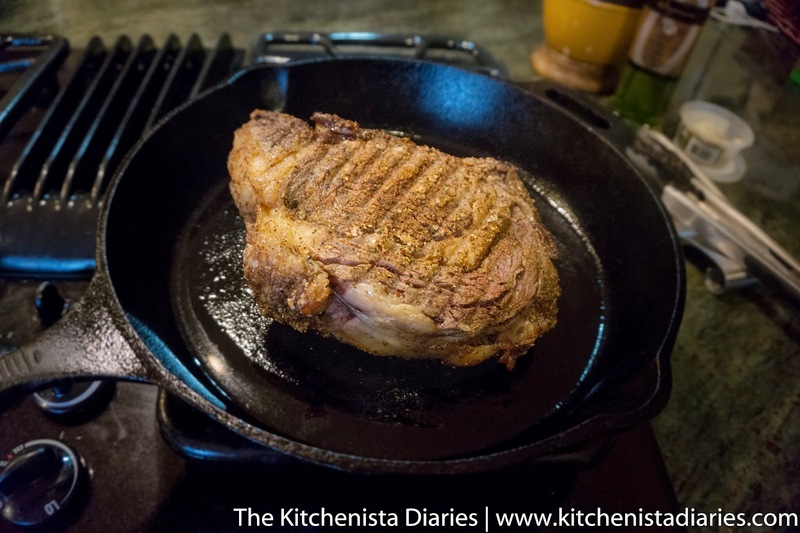 To sum up the video, the reverse sear method works by slowly roasting the meat in low heat to bring it up towards your target internal temperature, and then finishing with a hard sear in a screaming hot skillet. My end goal was a medium rare finish, landing between 125° F and 130° F. Instead of the usual "bull's eye" appearance of a traditionally seared steak which is pink in the center and gradually turns brown towards the outer crust - the reverse seared steak is pink all the way through from top to bottom. Only the outermost crust gets cooked to well done. It is evenly cooked and beyond perfect. The other really nice thing I liked about this method is the timing of the resting period. Resting a steak is a critical step to ensure the juices get redistributed into the meat before slicing it open - otherwise the juices bleed out onto your plate and all is lost. 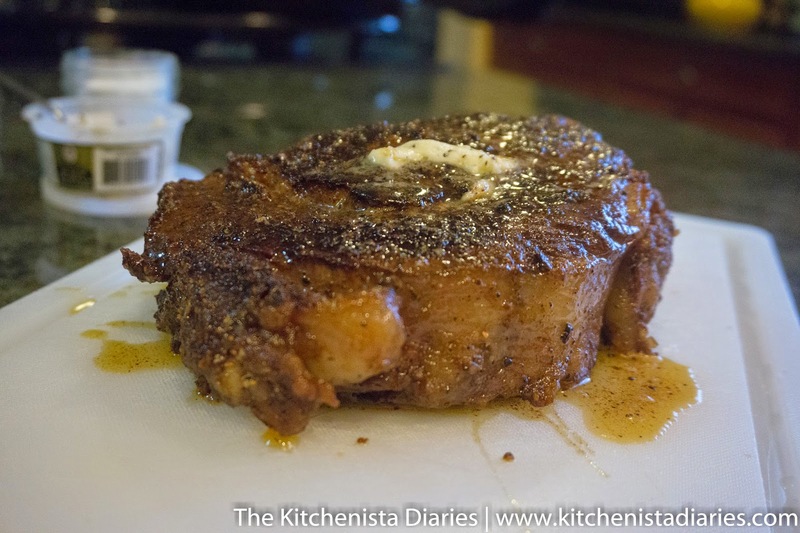 With the reverse sear method, the steak is rested after it comes out of the oven, before searing. 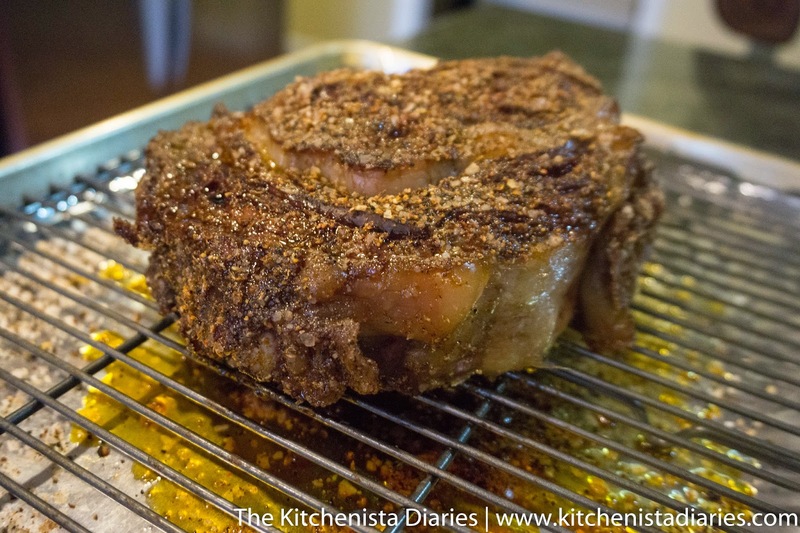 It doesn't need to be rested again after coming out of the skillet. That means you can better time your steak to serve for your guest(s) and serve it hot. 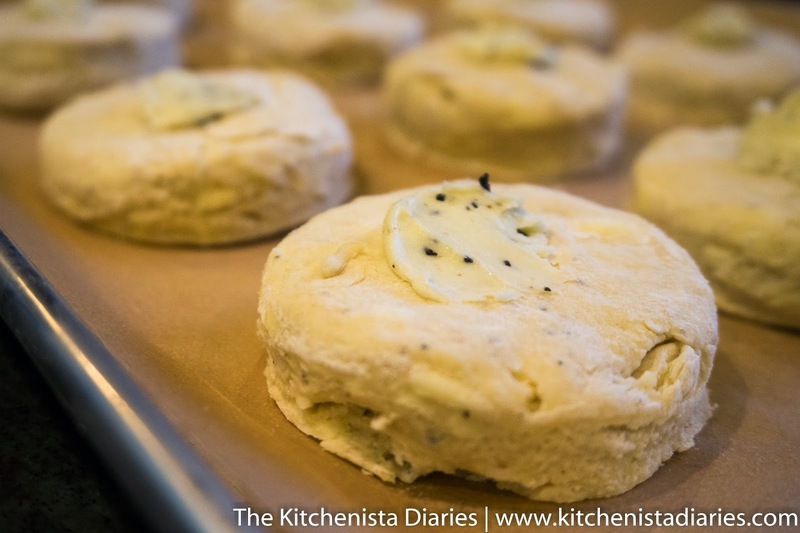 I used my resting time to bake some truffle butter parsnip biscuits, and roast asparagus spears. 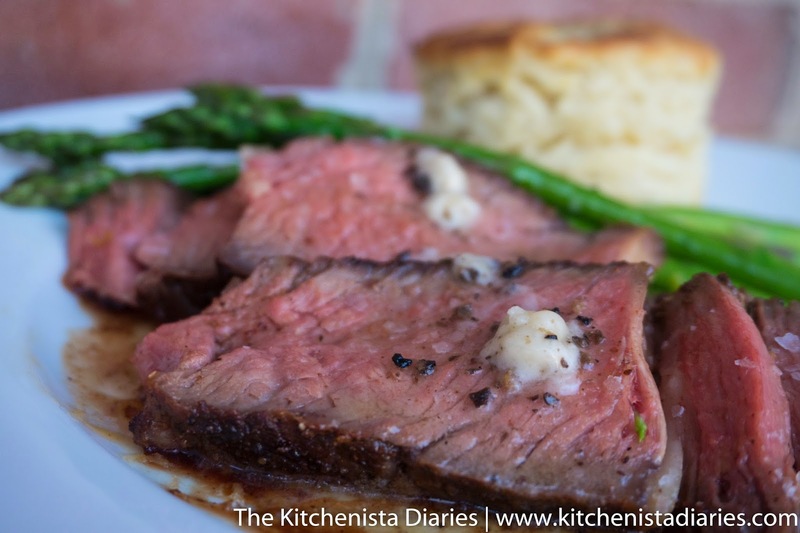 This is a rich (pun somewhat intended) dish, between the fatty rib eye steak and the savory truffle butter. I recommend going easy on your sides. I opted for a fluffy biscuit, but a simple parsnip puree would be another killer option. Likewise, your veggie is best simply prepared. I chose asparagus, which is always a great pairing with steak. Olive oil, salt, cracked black pepper and a finishing splash of lemon juice bring some welcome freshness and acidity to cut through the steak. Finally, remember that a few generous slices of cooked steak will be your serving for one person. The result is a dish that is satisfying without leaving you feeling stuffed. I'm sure you'd rather save room for dessert, right?! And by all means, please don't miss an opportunity to have some form of steak and eggs for breakfast. 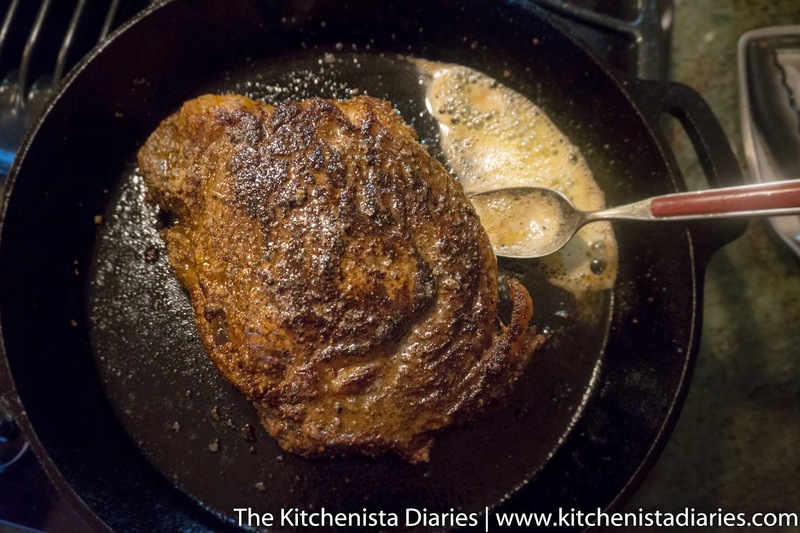 A quick kiss in a hot skillet is all you need to reheat a few slices of leftover rib eye. 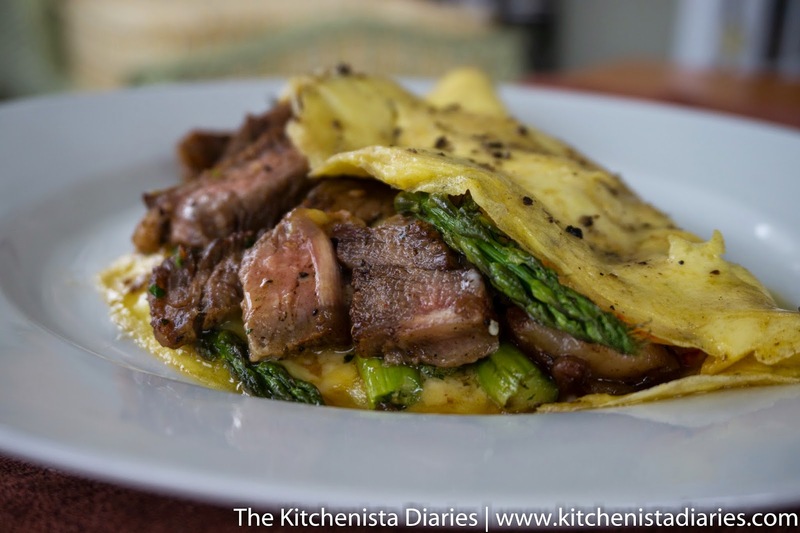 Truffle butter steak & asparagus omelette, anyone? *The rub is optional, but recommended. 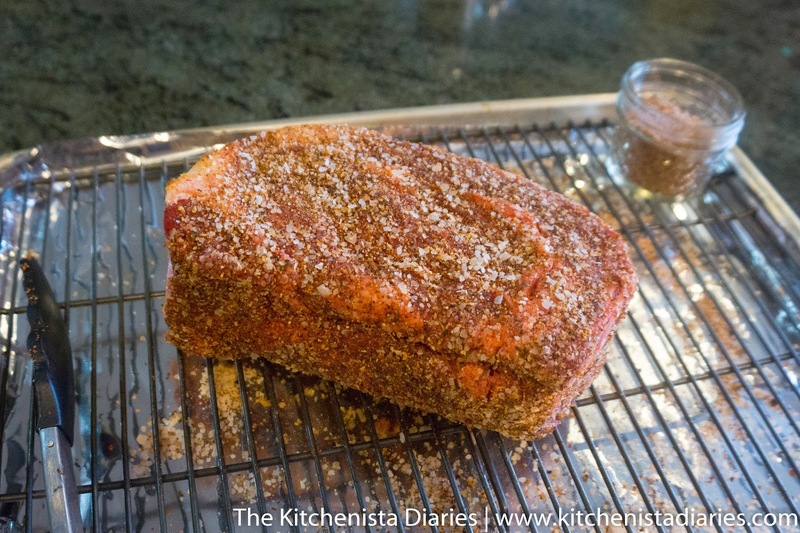 Feel free to use your own seasoning, or just a generous amount (2 to 3 tsp) of kosher salt and plenty of cracked black pepper. About 30 minutes before you plan on cooking the steak, set it out on the counter to take the chill off. 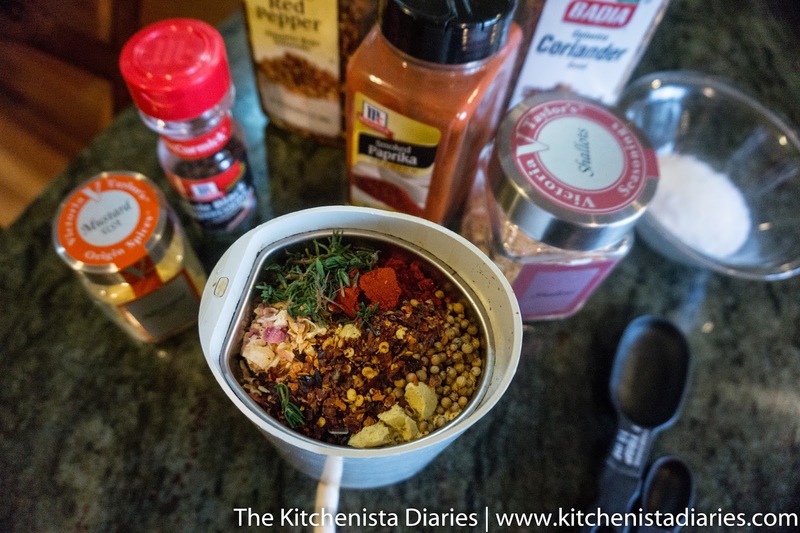 In that time you can make the rub or gather your other ingredients. You probably also have side dishes to prep, so always try to use your time wisely. 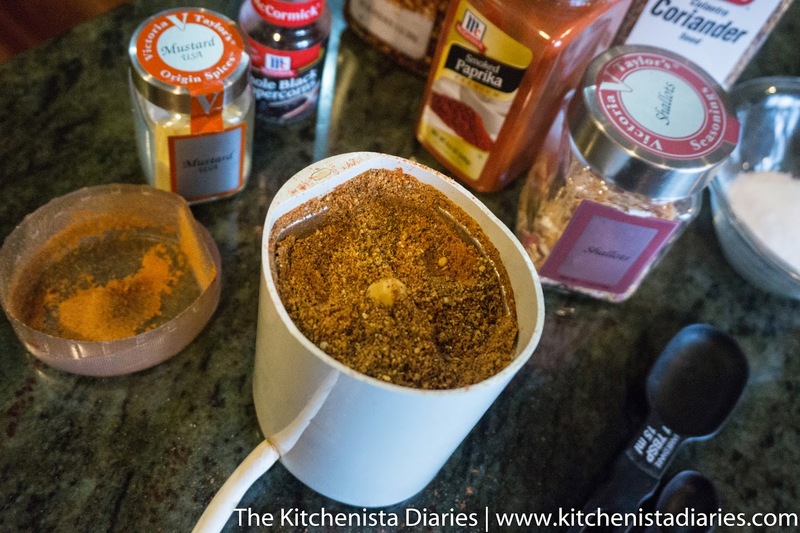 To prepare the rub, combine all of the spices in your grinder. Don't include the salt yet. 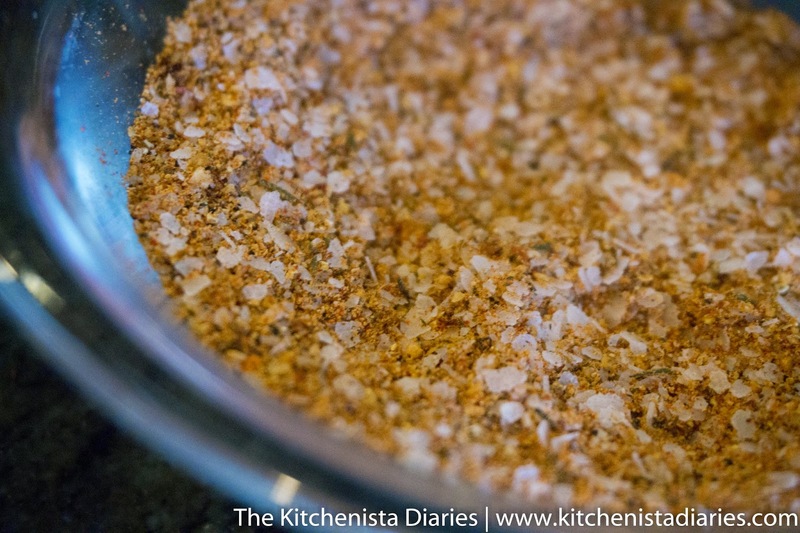 Grind everything up until it's a fairly fine powder. You may see a few pieces of cracked pepper here and there which is totally fine. I'm a huge proponent for grinding fresh spices when possible. Of course, feel free to use your own prepared blend if you have a favorite! This one is reminiscent of a Montreal steak seasoning, to give you a point of reference. Stir in the coarse kosher salt, and you're done. I prefer not to grind my salt up. Besides giving the steak more of a crust, it's easier to get a feel for how much salt I'm using. My recipe makes about 1/2 cup, so store leftovers in a tightly sealed jar. So as not to contaminate your seasoning with raw meat, always pour out what you'll use for the steak into a separate container before using. By the way, there is absolutely nothing wrong with sticking with a basic salt and pepper rub on a good piece of steak. Estimate about a teaspoon of kosher salt per pound of meat, so in this case 2 to 3 teaspoons. Plenty of freshly cracked black pepper. Rub your steak down with one tablespoon of oil, and then season it generously with the steak rub. I used a little more than two tablespoons. Be sure to press the seasoning into the sides as well. Lay your steak on a rack set over a heavy baking sheet. This will ensure the air can circulate underneath the steak and keep it roasting evenly. It also allows fat to drip as it renders from the meat. Preheat your oven to 275° F. I use a digital probe thermometer because it allows me to leave the steak where it is and monitor the internal temperature without opening the oven door. The probe stays in the meat and the digital reader remains outside of the oven, where it can be set to beep when the meat reaches its target. If you don't have one of these, it's a great add to your kitchen. 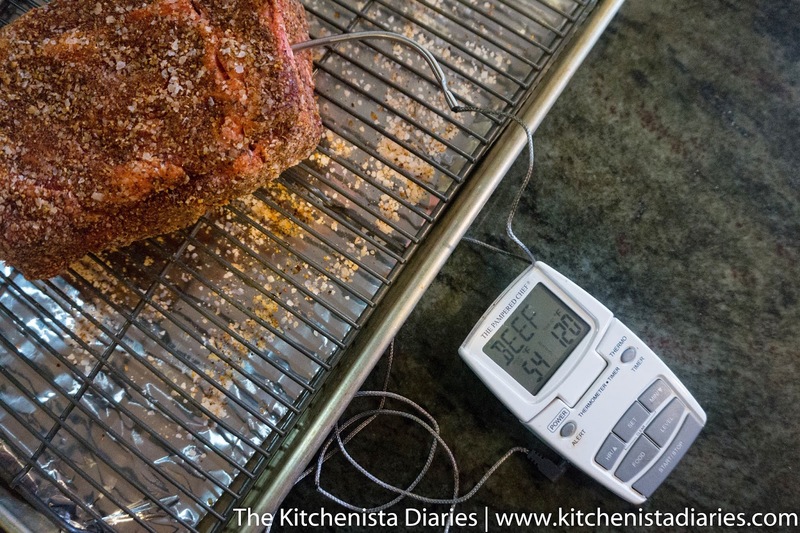 A stand alone instant read thermometer is also fine, you just can't leave it in the steak while it cooks. 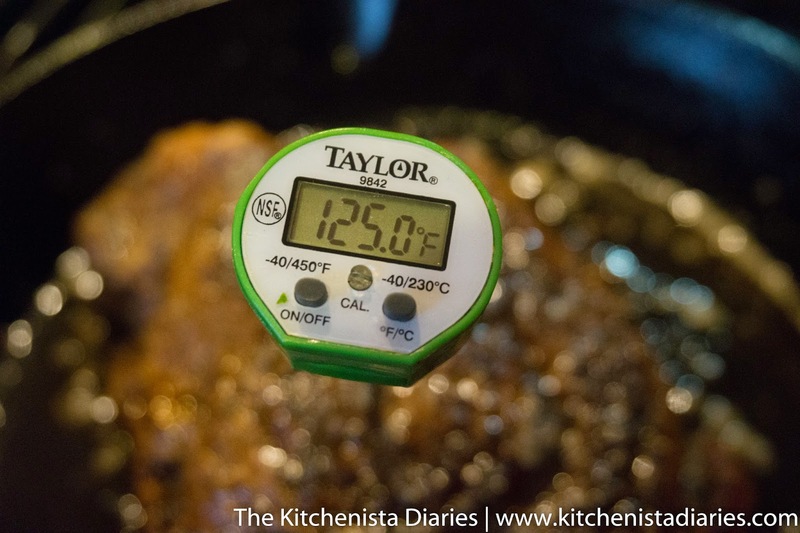 It is pretty crucial to this technique to monitor the temp though, so don't leave it to guesswork. The steak should take anywhere from 45 minutes to 1 hour to reach 120° F, which was my target for this step. That's just shy of the temp mentioned in the video above so that I would have plenty of time to give my steak a good basting in the skillet without overcooking. If you prefer a medium steak, 125° F will be your target. It looks a bit scary when it's at this point but don't worry. I was also terrified that I cooked it for too long, but was reassured when I felt the steak and sure enough it was still rare inside. While the steak rests (15 to 20 minutes is adequate), preheat your cast iron skillet and finish preparing your side dishes, if applicable. 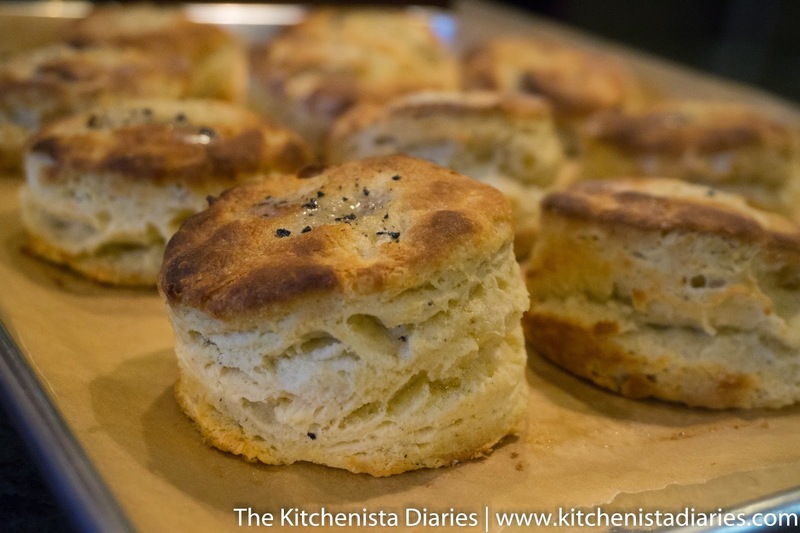 I made these biscuits earlier in the day and froze them so they'd be ready to bake. 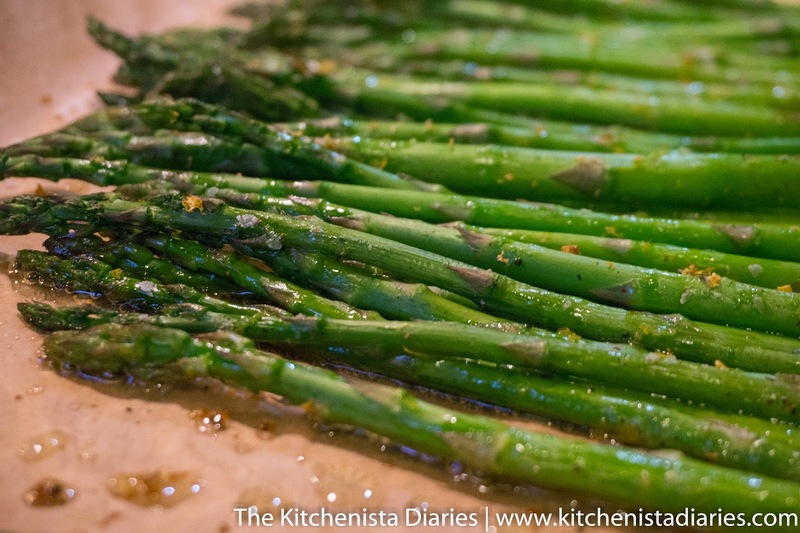 I also popped my asparagus spears in the oven in the last ten minutes so they could roast. When the steak has rested and the cast iron skillet is screaming hot - just shy of smoking - add the remaining tablespoon of oil. Place the steak top down in the skillet, it should immediately sizzle. If not remove it and allow your skillet to get hot enough before proceeding. 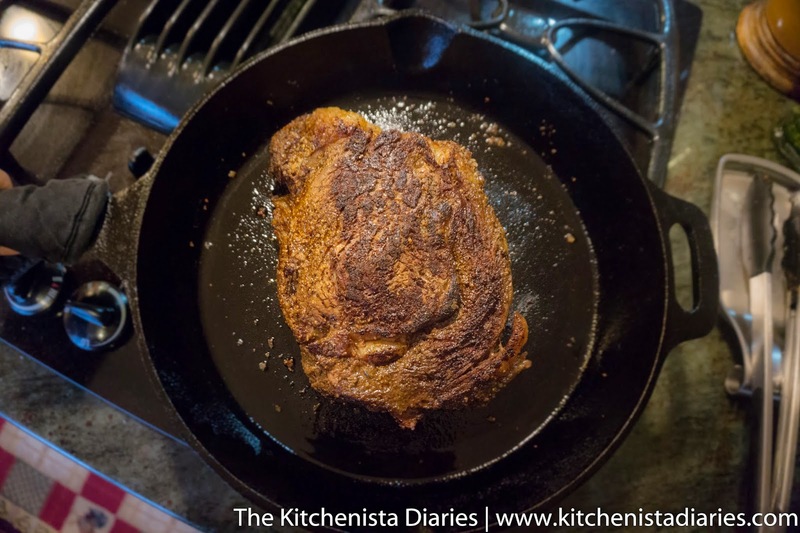 It will only take a minute for the surface of the steak to brown and get a little crusty. Flip it over to sear the other side. Now for the fun part. 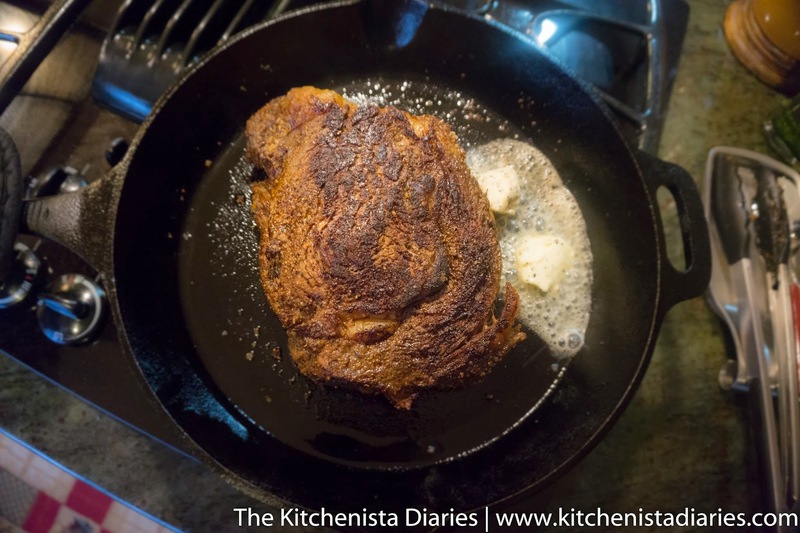 In the final minute of searing, drop in a few teaspoons of truffle butter. Using one hand to carefully lift up the skillet handle (protect your hands with a pot holder or oven mitt), use the other hand and a spoon to baste the steak with the melting truffle butter. Just dip the spoon into the pool of butter and toss the butter over the steak. Aim for areas of the steak that haven't fully browned yet. It's like bathing your steak in truffle butter. Keep an eye on the temperature of the steak. After all that work you don't want to overcook it here. It should only take a minute or two to reach 125° F, or if you targeted medium, somewhere between 130° F and 135° F, tops. 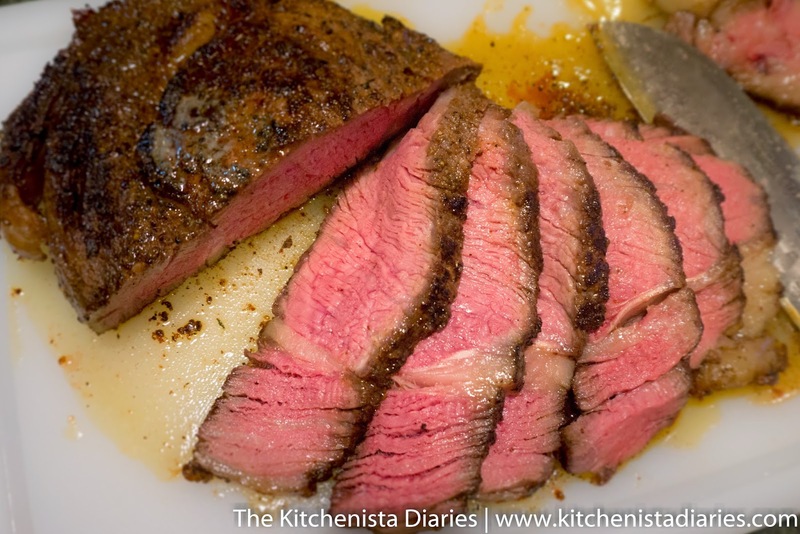 When the steak has finished searing and basting, remove it from the skillet onto your cutting board. Go ahead and top it with a dollop of truffle butter for good measure. It is perfectly okay to slice your steak now. Just remember to slice against the grain. 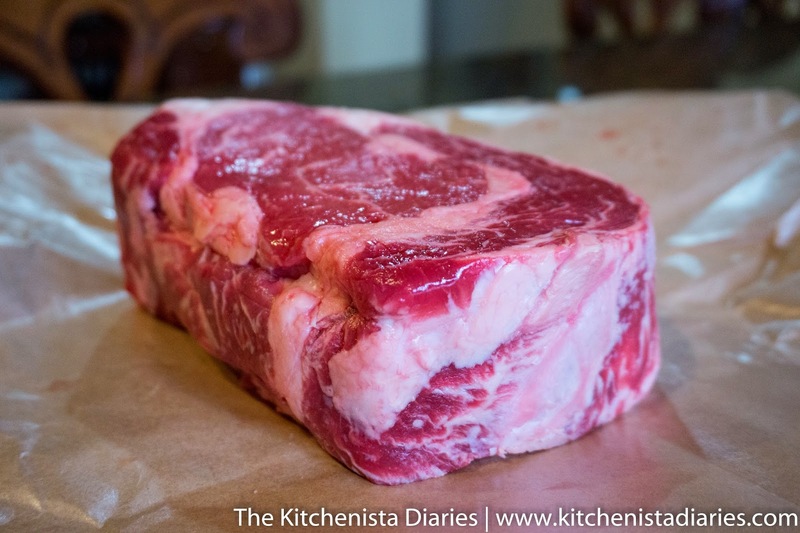 Rib eye will have some good pieces of fatty ends. I won't tell anybody if you save those little morsels for yourself as a reward for your hard work. Don't be shy serving these delectable slices of rib eye up. A little final bit of truffle butter melting over the top and a pinch of salt is absolute perfection. Enjoy. And if you're celebrating, Happy Valentine's Day!